My poor family. They have been subjected to the worst meals EVER recently. Ever since I got an indoor grill for Christmas, our meals have consisted of a slab of lean, grilled protein and a green vegetable, usually roasted broccoli or brussel sprouts. (My poor husband...he HATES brussel sprouts...he thinks they make the house smell like farts, which they do, but I happen to love them.) The grill is just so easy to use, and let's face it, I'm lazy. Yes, it has helped us lose a few pounds, but I needed to break out of this rut. Thankfully, my parents sent me an easy recipe for shredded taco chicken. It was super low maintenance and made a ton! And my family devoured it (although they were probably just excited to get something besides grilled chicken breasts and broccoli). 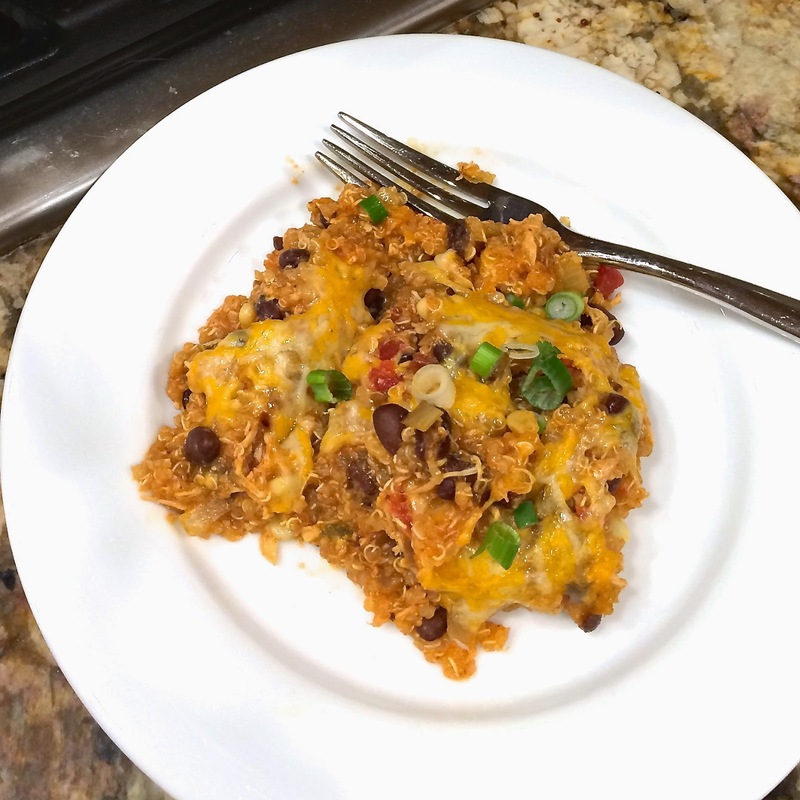 We got a lot of meals out of it, but to make it go even further, I decided to use it in this casserole. You could also use a rotisserie chicken from the grocery store or cook some chicken breasts that you have on hand. Or you could leave out the chicken and keep it vegetarian. Up to you. Preheat the oven to 350°. Lightly grease a 9 x 13 baking dish. Cook the quinoa in the water according to the package directions. Set aside to cool. In a medium skillet, add the olive oil and cook the onion over medium heat until softened. Transfer to a large bowl. Add the chicken, black beans, corn, diced tomatoes with their juice, enchilada sauce, cumin, chili powder, and salt to the bowl with the onions. Mix well. Add the cooked quinoa and half of the cheese. Mix well. Season with salt and pepper to taste. Pour the mixture into the prepared baking dish. Top with the remaining cheese. Cover with aluminum foil and bake for 20 minutes. Remove the foil, and continue baking for another 15-20 minutes, or until the cheese has melted. Remove from the oven and let cool for 5 minutes. Garnish with thinly sliced scallions and cilantro.